When you chit chat on the phone, do find your self mindlessly scribbling swirls and waves, curly-cues and spirals, zig-zags and dots, or lines and patterns on scrap paper? If you do, then you are most likely a doodler! My mother-in-law, and hubs have both been diagnosed with “doodleitis“, and hubs has passed this doodling addiction down to my oldest daughter. 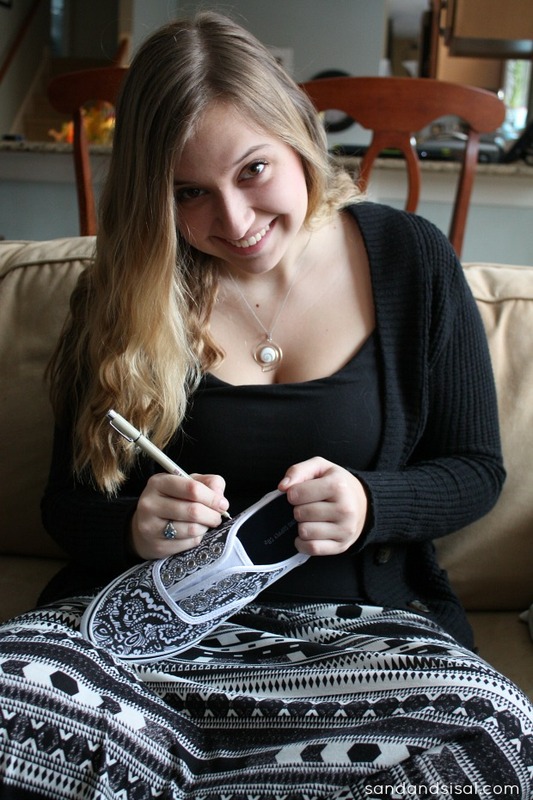 Most spare moments Morgan might have are spent doodling, drawing, and designing. She has her own unique sense of style and for her, plain, white, canvas shoes just won’t do. Oh no. She decided to get her creativity on and doodle her style! 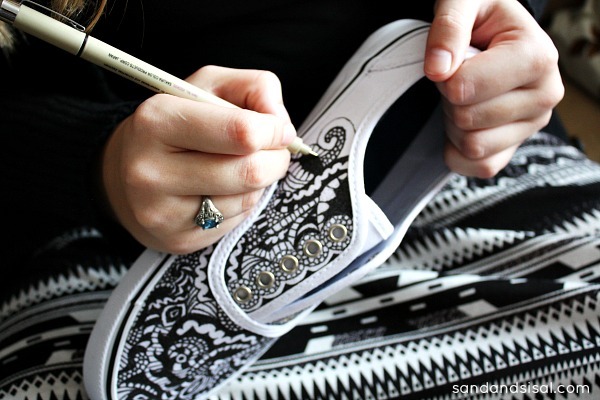 Let’s look at how to decorate canvas shoes in the popular Zentangle method! Morgan is a senior, graduating soon, and heads off to college this fall (sniff… sniff… whaaa!). She has a love for children and wants to follow in her father’s footsteps and become a Dr. of Physical Therapy, specializing in Pediatrics. Art, anime and speaking Spanish are her other few loves. We are so proud of her! 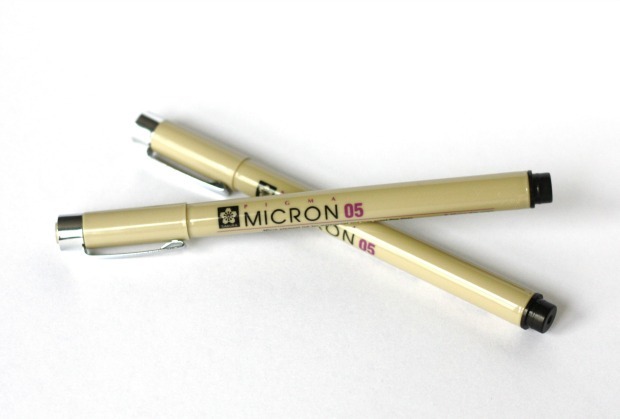 Ok, enough motherly doting… let me show you the pens she uses to decorate canvas shoes. Available in black or in a selection of colors. 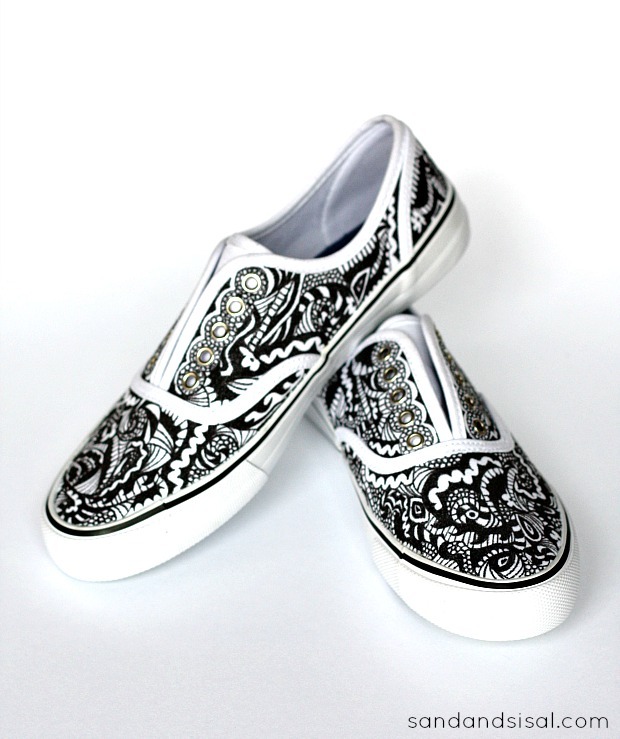 She bought inexpensive white canvas shoes from Target, removed the laces before drawing and then started her doodling at the toe section. Each of the shoes is different but the she tried to keep the style of the doodle consistent. A few hours later and voila! 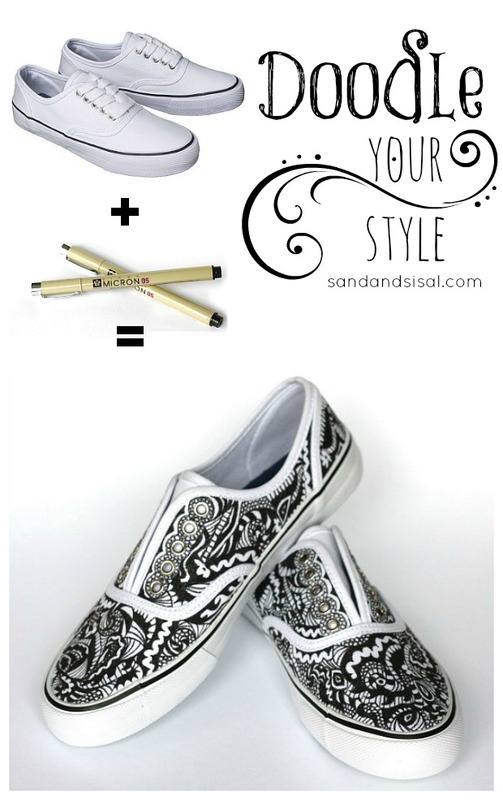 Customized designer looking canvas shoes! So if you think you too have the diagnosis of “doodleitis”, put it to good use, and start doodling your own style! I love the shoes. I bet you could sell these in a flash. Thanks! Now that’s an idea! Oh my god! Your daughter is so talented and creative…. These “doodlesneaks” are fabulous! just totally make you feel happy looking at them! I must have a pair, they’ll be the go to sneak for summer! Are you selling them? Cause I want a pair! Oh those are soooo CUTE. I may have to do some for my daughter, Kayla. She did not get the doodleitis gene, although my boy did. Hmmm, maybe I will have him make some. That sounds like a plan. BTW, my daughter, Kayla, is graduating in a few months too and going off to college shortly after. I feel your pain. It’s hard to let go and let them grow up, isn’t it? Hi Shelia! Morgan says thank you so much! And yes, I am dreading the day I have to take her to school! Way to go Morgan! I love them! I love it! I just forwarded it to our daughter (college student) since I could see her doing this. Have you seen Doc McStuffins on Disney Junior? Doodle-itis is definitely something she’d diagnose! Morgan definately is artistic, looking at those sneakers she is working on. Oh, my gosh, maybe she should contact some shoe manufacturers and see if they would be interested in promoting her designs..She can use her creative talents in many postions..graphic design, publishing, lots of avenues out there for her talent. Certain art skills, people never make money off but I feel she could just seeing her “doodling” as you call it, she definately has lots of potential and should start a portfolio of her work. Come on’ Mama..your photographic skilss and your camera will come in handy. Morgan, your artwork work is excellent! That is an great idea. I will do it on my Topper shoes. P.S. : Your daughter have the prettiest smile that I ever seen.